70. da Silva, A. G. M.; Rodrigues, T. S.; Slater, T. J. A.; Lewis, E. A.; Alves, R. S.; Fajardo, H. V.; Balzer, R.; da Silva, A. H. M.; de Freitas, I. C.; Oliveira, D. C.; Assaf, J. M.; Probst, L. F. D.; Haigh, S. J.; Camargo, P. H. C. Controlling Size, Morphology, and Surface Composition of AgAu Nanodendrites in 15 s for Improved Environmental Catalysis under Low Metal Loadings. ACS Applied Materials & Interfaces, 2015​, 7, 25624. 69. Wang, J.; Alves, T. V; Trindade, F. J.; de Aquino, C. B.; Pieretti, J. C.; Domingues, S. H.; Ando, R. A.; Ornellas, F. R.; Camargo, P. H. C. Theoretical Design and Experimental Realization of Quasi-Single-Electron Enhancement in Plasmonic Catalysis. Angewandte Chemie International Edition, 2015, 54, 14427. ​68. da Silva, A. G. M.; Rodrigues, T. S.; Wang, J.; Yamada, L. K.; Alves, T. V.; Ornellas, F. R.; Ando, R. A.; Camargo, P. H. C. The Fault in Their Shapes: Investigating the Surface Plasmon Resonance-Mediated Catalytic Activities of Silver Quasi-Spheres, Cubes, Triangular Prisms and Wires. Langmuir, 2015, 31, 10272. ​67. da Silva, A. G. M.; Lewis, E. A.; Rodrigues, T. S.; Slater, T. J. 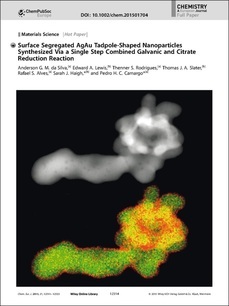 A.; Alves, R. S.; Haigh, S. J.; Camargo, P. H. C. Surface segregated AgAu tadpole shaped nanoparticles synthesized via a single step combined galvanic and citrate reduction reaction. Chemistry - A European Journal, 2015, 21, 12314. 66. Rodrigues, T. S.; da Silva, A. G. M.; Macedo, A.; Farini, B, W.; Alves, R. da Silva. ; Camargo, P. H. C. Probing the Catalytic Activity of Bimetallic versus Trimetallic Nanoshells. Journal of Materials Science, 2015, 50, 5620. 65. 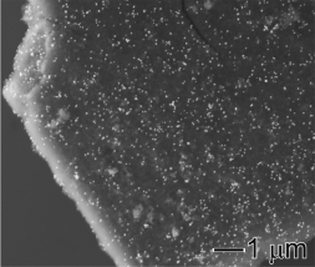 Wang, J.; Trindade, F. J.; de Aquino, C. B.; Pieretti, J. C.; Domingues, S. H.; Ando, R. A.; Camargo, P. H. C. Probing the Catalytic Activity of Reduced Graphene Oxide Decorated with Au Nanoparticles Triggered by Visible Light. Chemistry - A European Journal, 2015, 21, 9889. 63. Wang, J.; Ando, R. A.; Camargo, P. H. C. Controlling Selectivity in the SPR-mediated Oxidation of p-Aminothiophenol in Au Nanoparticles with Charge Transfer from UV-excited TiO2. Angewandte Chemie International Edition, 2015, 54, 6909. 62. Rodrigues, T. S.; da Silva, A. G. M.; Gonçalves, M. C.; Fajardo, H. V.; Balzer, R.; Probst, L. F. D.; Camargo, P. H. C. AgPt Hollow Nanodendrites: Synthesis and Uniform Dispersion over SiO2 Support for Catalytic Applications. ChemNanoMat, 2015, 1, 46. - Featured among the most accessed papers from 03/2015 to 02/2016 in the Journal's website!